DOYLESTOWN (PA) – The Delaware Valley University defense forced six turnovers and allowed just 189 total yards as the Aggies captured the Keystone Cup and clinched a berth in the inaugural Centennial-Middle Atlantic Conference (MAC) Bowl Series with a 20-3 home win over archrival Widener University. The victory improved DelVal to 8-2 overall and 7-2 in the MAC. The Aggies did not receive the help they needed to get a share of the conference crown and the league's automatic berth to the NCAA Division III playoffs as Albright College took care of business and clinched it all with a 38-13 victor over Lebanon Valley College. However, DelVal will have one more game and it will be home as the Aggies are the top remaining team in the MAC following Albright's NCAA bid and they will host the second-highest remaining team from the Centennial. That opponent and the game time for the Saturday, November 21 contest will be announced at 7:00 p.m. on Sunday (the NCAA selection show is at 6:00 p.m.). It will mark the 12th time in the last 13 years that DelVal has reached the postseason. 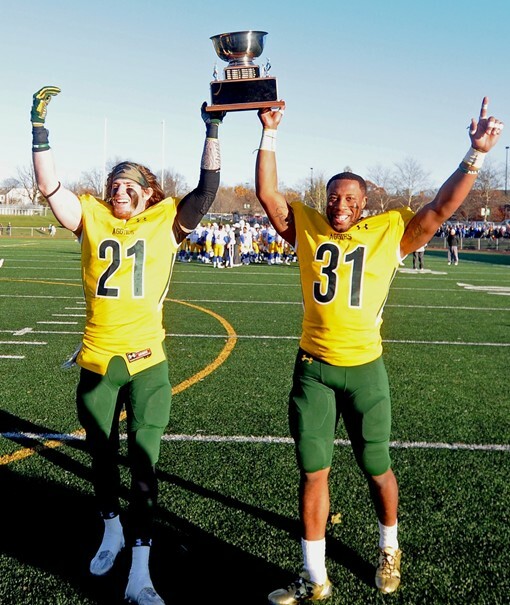 Saturday's win is also the ninth time in the last 13 years that the Aggies claimed the Keystone Cup, the trophy that annually goes to the winner of the DelVal-Widener contest in recognition of small college football excellence in the Philadelphia area. Widener's season ends with a 6-4 overall record and a 6-3 mark in the MAC. DelVal's defensive performance on Saturday is one reason why the Aggies' season continues. Just one week after surrendering 43 points in a one-point loss at Lycoming College, the unit shut down a Pride offense that scored a combined 98 points over the last two weeks. The Aggies registered four interceptions, two fumble recoveries and six sacks as Widener was held out of the end zone for the first time since its season opener in 2010. The Pride managed just 126 yards in the air and 63 on the ground. DelVal's defense also got into the scoring act as it notched the first touchdown of the day. The Aggies were up 3-0 following Nick Restaino's 32-yard field goal with 3:52 left in the first quarter. On the ensuing possession, Alex Krivda's pass was picked off by linebacker sophomore Nick Wright as he wrestled the ball away from the Widener receiver. Wright then took it down the left sideline 21 yards for the touchdown just 26 seconds after Restaino's field goal for a 10-0 lead. Early in the second quarter, sophomore cornerback Anthony Martinez intercepted a Krivda pass, broke several tackles and returned the pick 44 yards to the Pride eight-yard line. DelVal loss a yard over its next two plays and had third-and-goal from the nine when freshman quarterback Dashawn Darden hitMichael Jensen for the touchdown. Restaino added the point-after for a 17-0 advantage with 12:18 to go before halftime. Widener picked up its lone points on its next drive as kicker Ryan O'Hara set a Pride record with a 52-yard field goal. It came with 9:32 left in the first half and it was the final points of the stanza. After Widener went three-and-out to start the second half, Darden had a 45-yard run that eventually set up a 21-yard field goal by Restaino for a 20-3 score with 9:26 left in the third. That was it for the scoring, thanks to the Aggie defense as Wright notched his second interception of the game on the next drive and Shawn Miller added one in the fourth. Both forced fumbles were caused by senior safety Danny Wynne as Luke Boonstra recovered the first and Wright was there to recover the second. Wynne finished with five tackles, two forced fumbles and a sack. Fellow senior and captain Rashaad Lighty had a monster day with seven tackles and 3.5 sacks, the third-highest sack total in a single game. Wright had two interceptions, a fumble recovery and one tackle. Offensively, DelVal finished with 250 yards, including 208 on the ground. Darden had 10 carries for 94 yards and was also 3-for-7 for 42 yards and a score.Robert Cleveland netted 56 yards on 13 rushes. For Widener, Krivda and Seth Klein were a combined 17-for-43 for 126 yards and four interceptions. Robert Getz rushed for 60 yards while Blaine Price had nine catches for 83 yards. Steve Gozur, Shakore Phillips and Stacey Sunnerville had 10 tackles apiece to lead the Pride's defensive effort.